Greetings friends and fellow crafters. So today is the last day for the Coffee Lovers Blog Hop, and this is my 4th project for this fun event. SO, I used the Tim Holtz "Splatters" stencil and Walnut Stain Distress Oxide to be the background of my project. I used the "Fired" stamp from Creative Vision stamps and Versafine Onyx Black Ink for the sentiment. A die from my stash and inked the edges with the Walnut Stain. The Coffee Cup is a die from my stash as well. I made this as a 4.25" x 5.5" base. Beautiful use of stencil! Your colouring is amazing! Ok, that sentiment made me laugh. I feel so bad that the coffee spilled but it goes so well with your sentiment. How fun, love the stenciling! I love the touches of gold, the fabulous sentiment and the colorful coffee cup. What a fantastic creation! Great sentiment and love that colorful cup and the spills. Love the coffee cup in bright colors with great fun sentiment! Cute card and colors. Fun sentiment. Beautiful cup and great sentiment. Lovely card. Hahaha! 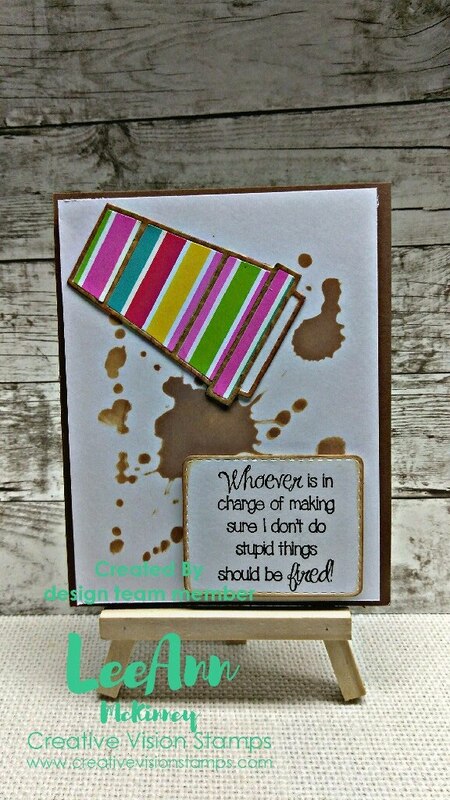 Love the sentiment and stripey cup!